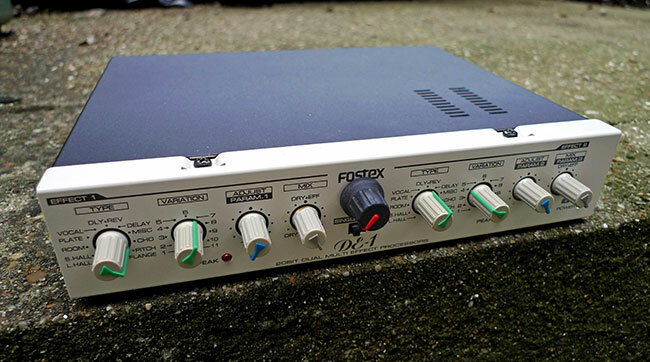 The Fostex DE1 is a budget half rack processor that was released alongside a torrent of similar devices in the late 90's. 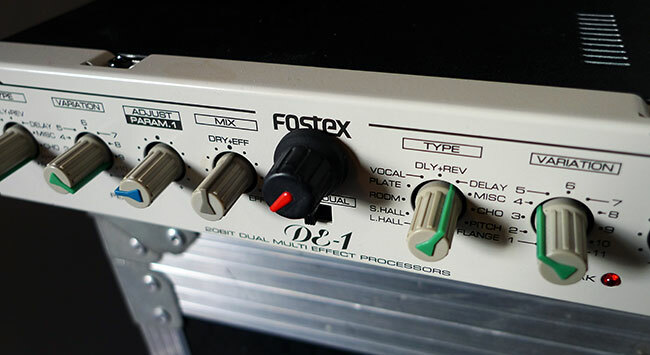 The vast number of these kind of budget effects boxes might of had something to do with the fact that like the Fostex DE1, a lot of them seemed to use more or less identical 'off the shelf' DSP modules. The same core effects were probably used in dozens of similar units. In fact the DSP core of the DE1 is mounted on its own separate daughter board, presumably so Fostex could use the same effects core in various other digital mixers and multitrack recorders it was producing at the time. The DE1 does have an interesting feature in that it is in fact two effects units. In 'single' mode it acts as one stereo effects unit with a stereo input and output. In this mode you get 16 variations of each effect, with three adjustable parameters per variation. The single mode makes better use of stereo effects. In 'dual' mode the unit acts as two independent processors. Both have a mono input and there are two pairs of stereo outs, one of effects unit 1 and the other for unit 2. In this mode there are still 16 variations per effect on each processor, but there is only one editable parameter per variation. The only mod we have done on this unit is a simple reclocking mod using a LTC1799 oscillator module. This adds a knob to the front of the unit that controls the clock speed of the effects DSP and sample RAM. This esets the sample rate of all effects, plus the decay of reverbs, processing speed of pitch shifting, delay time, chorus speed/delay etc etc. Some interesting reverb effects are achieved as a result of changing the length of the reverb decay by slowing down the system clock, rather than changing the decay parameter. Short reverbs turn into huge grainy washes of sound at low clock settings, while early reflections become strangely diffused delay effects. Pitch shifting effects also produce some very strange results. Cheap pitch shifting is always a little lumpy and delayed, as you need some serious processing power to process small enough chunks of audio quickly enough for a convincing shift The DE1 pitch effects are fairly dubious to begin with, but add the effect of slowing down the system clock and an extreme pitch shift starts to sound a whole lot more sinister and unnerving. Not the kind of effect you'd want to meet in a dark alleyway. The only minor drawbacks with this mod is that as you take the clock down to its lower settings, the unit does slowly develop a distinct whine that can be heard on top of the processed sound, and then at the very lowest settings a strange hiss becomes apparent. This is very common when installing mods of this type, and on other units it does tend to be quite annoying, although on the DE1 it does impart a certain extra ambiance to the sound. Kind of like record crackle on a sampled breakbeat. The second is the DE1 effecting a drum loop, and then some odd flanging and reverb effects on single drum hits.